When your favorite fruits aren't in season, here's a solution to this unseasonal dilemma: Dried Fruits. As snacks, they deliver a burst of concentrated flavor. And in these recipe, most of the fruits reconstitute to a product similar to fresh. Until cherries ripen again, these will do just fine. 1/2 - cup chopped walnuts. - Beat butter at medium speed with an electric mixer until creamy, gradually add sugar, beating well. Add eggs, on at a time, beating after each addition. Stir in lemon rind and juice. - Combine flour, soda, and salt, add to butter mixture alternately with buttermilk, begining and ending with flour mixture. Stir just until blended after each addition. Gently stir in cherries and walnuts. - Spoon batter into lightly greased muffin pans, filling three-fourths full. - Bake at 400 degrees for 20 minutes or until lightly browned. Remove from pans immediately. mmmm! That is one delicious muffin! 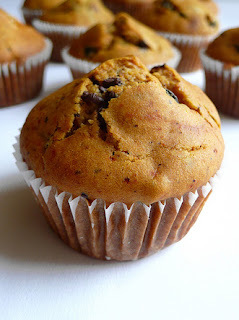 I also use a lot of dried fruits in my muffins and granola... they taste great! Oh that looks so good! I adore dried cherries... I think I could sit and eat them by the pound. Haha! Will have to give this a try soon! Great idea! I love dried fruits - the flavor is so intense! Looks and sounds amazing. Thanks for sharing the recipe.